This should really prove to be the ultimate hipster movie. It’s a great case of “Oh, Rodriguez? I’ve known about him for years now.” For the layman, like me, I had no idea. 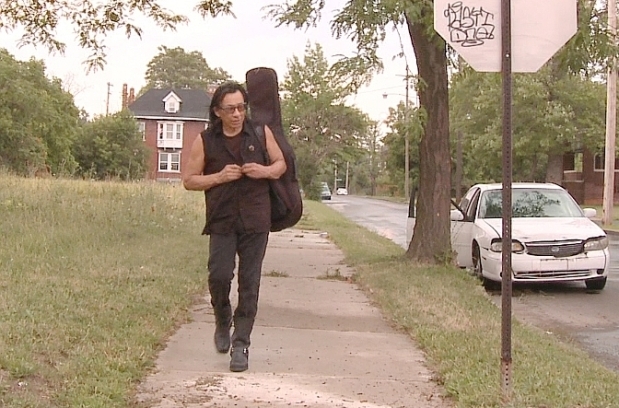 ‘Seaching For Sugar Man’ is a documentary that uncovers the bafflingly improbable career path of 60s-70s musician, Rodriguez – a solo songwriter and resident of downtown Detroit. As we learn, while Rodriguez never found any commercial success – and very little artistic recognition – in the United States, his album, ‘Cold Fact’ found its way into the hands of the angry and disenfranchised residents of South Africa; his face became synonymous with resistance. His songs bred white-picket-fence anarchy. 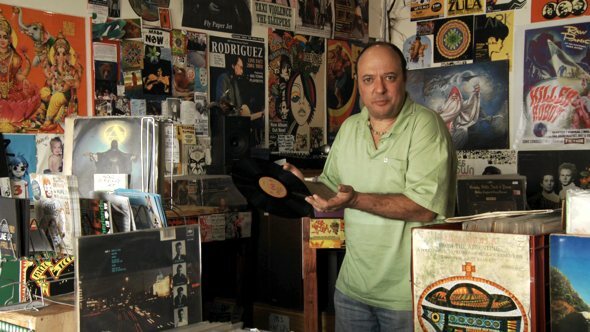 Rodriguez became a hero of the people – and he, for many decades, never knew it. Detroit and Rodriguez are bound together in life, woven into his music and his day-to-day. Some of the film’s most poignant moments come from tracking shots like this one. In uncovering what happened to Rodriguez, ‘Searching For Sugar Man’ almost mythologizes his albums – transforming him into a musical hero, underdog creative and, as it turns out, an icon of political resistance in South Africa during its vicious years under apartheid. Director Malik Bendjelloul assembles an impressive tale, stitching together years of collected footage, connecting the dots between Rodriguez’s South African fan base, eager for any scrap of information about the enigmatic musician, and what happened in the intervening years. It’s potent stuff for filmmaking. At times presented very simply, camera testimonials begin to give way to gorgeous animatics of Rodriguez walking the streets of Detroit; the striking skylines of this hardened city comparing to the equally dismal South African cityscape. There’s a lot of very considered structure here – which is a bit of a relief, given how easily Bendjelloul could’ve fallen back on simple to-camera exposition and narration. Instead, Sugar Man proves extremely watchable and largely well-paced. Stephen ‘Sugar’ Segarman, long-time music fan and Rodriguez advocate, was instrumental in tracking down this enigmatic musician. It’s the soundtrack, however, that is the real star attraction here. For us non-music aficionados, Rodriguez’s best tracks score the interstitial footage, placing his lyrics and tone against the striking portrait of life in 1970s Detroit. Whether you place him on par with (or beyond) his folk contemporaries of the time, there’s no question his voice is striking, delicate – almost paper thin at times. It’s his lyrics that stand out – and I have to agree: Rodriguez is a criminally overlooked artist who had all of the talent and none of the marketing or, as we see, cutthroat desire to succeed at any cost. This is a fine documentary; insightful and entertaining with a genteel approach to uncovering a figure so close to the hearts of an unexpected fan base. At times, it could be perceived as the ultimate marketing tool, of course – the aggrandizing, mythologizing approach to this forgotten genius is surely and finally going to bolster sales in his indifferent home country. If you can shake that cynicism, however, Searching for Sugar Man is a sweet find and a treat for lovers of music and underdog stories. Follow @ShotgunCritic on Twitter, whydoncha?